Every day brings more headlines in the European debt drama: "Greece elects anti-austerity government." "Greek Finance Minister says he won't negotiate with the 'Troika.'" "Anti-austerity movements gain ground across Europe." 1. 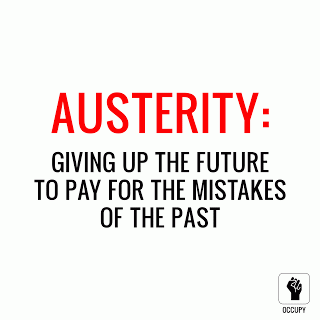 What is "austerity economics"? Austerity economics is based on the belief that healthy economies require lower government debt. Wikipedia calls it "a policy of deficit-cutting, lower spending, and a reduction in the amount of benefits and public services provided." Public services take a back seat to spending cuts in austerity economics. Privatization is a big part of the package, so government shrinks under an austerity regimen while corporations seize greater control of the economy. Tax increases may be considered, but only when they're used to pay down debt. In practice, austerity economics benefits the financial and corporate sectors at the expense of public sector items like education, pensions, medical care, and public transportation. A "Devil's Dictionary" definition of austerity economics might be: the practice of starving a population until it has enough to eat. The Eurozone's financial leaders have not, however, lost their enthusiasm for it -- especially its most influential leaders: the Germans. 3. Who has been most affected by austerity? Nations like Greece, Spain and Ireland, which suffered grave losses after the 2008 financial crisis, have been forced to borrow money under especially harsh conditions -- with special emphasis on government layoffs, privatization and reductions in social services. The results have been predictably grim. Nevertheless, the Troika has decided to double down on a failed policy. That's the informal term for the three bodies that have been managing debt on behalf of the European Community: the European Central Bank, the European Commission, and the IMF. The Troika (the word is sometimes capitalized and sometimes not) is responsible for managing Europe's debt crisis. The name comes from the Russian word for a harness that holds three horses, typically used for pulling long-distance or luxury sleighs. 5. Why is austerity triggering a political crisis in Europe? A number of European countries were forced to accept debt relief on terms that are unpopular with their own citizens. That set the stage for clashes between debt authorities and the democratically expressed will of the people. In some ways this is a uniquely European problem. When multiple nations share the same currency, decisions may be made that are acceptable to the citizens of one (Germany, for example) but not to those of others (e.g., Greece, Spain or Ireland). 6. Do we have a similar problem in the United States? Our nation's economic policy is managed by its elected leaders -- so in that sense, no, we don't have Europe's problem. But the United States has a financial elite, too, as we've seen since the crisis of 2008. The undue influence of Wall Street bankers (and their campaign contributions) has led to some unpopular and harmful decisions here as well. Here, as in Europe, there is ongoing tension between the democratic process and the power of the financial elite. That's why the Senate opposition to placing banker Antonio Weiss in a senior Treasury Department position was so important: bankers already have too much control over economic decision-making in our government. 7. What is Greece's new government trying to accomplish? The Troika has imposed very harsh conditions on the Greek people, and that has made the economy much worse. This is especially unfair given the fact that the Greek people didn't choose to incur this debt -- and they certainly weren't the bank officers who extended the credit. The widely respected financial journalist Martin Wolf notes that the enormous sums loaned to Greece "went overwhelmingly not to benefiting Greeks but to avoiding the writedown of bad loans to the Greek government and Greek banks." Only 11 percent was used to pay for government services. The Greek government is attempting to reduce the amount of debt it owes. That is not just a fair and reasonable idea: it's a practical necessity. Finance reporter Mike Bird does a good job of laying out the facts: no government could meet the expectations now placed on that country. While Greece's leaders are called "radical" and "impractical," it is Europe's financial leaders who are making unrealistic demands. Greece's leaders are trying to break the impasse. They were initially asking for a "haircut" -- reducing the amount owed to creditors -- but that has become a politically charged idea. So the Greek Finance Minister has come up with an alternative proposal that essentially does the same thing without forcing the Troika or Germany to back down. 8. Are Greece's new leaders "radical"? Some conservative economists of the late 20th century revived and revised older ideas about the infallibility of the free market, but their theories were effectively disproven by the crisis of 2008. Nevertheless, those theories appear to drive the demands now being placed on Greece. Syriza's broader platform promised "four pillars of national reconstruction": "confronting the humanitarian crisis," "restarting the economy and promoting tax justice," "regaining employment," and "transforming the political system to deepen democracy." These ideals would be considered admirable, and not extreme, by most Europeans (and Americans) of the last 50 years. If Greece's leaders appear radical to some, that is partly a matter of style. Many people in the financial world are unaccustomed to having their ideas or demands directly challenged, even when they're presented in an undemocratic or autocratic fashion. It upset some people, for example, when Syriza economic spokesperson (now Finance Minister) Yanis Varoufakis characterized Germany's policy toward Greece as "repeated fiscal waterboarding" -- but it was a pretty apt description. Varoufakis has also shown up to meetings as Finance Minister wearing a leather jacket, so there's that. 9. Why are Greece's leaders facing such strong resistance -- from the Troika, from Germany, and the leaders of some other European nations? Because the stakes are high -- not just for Greece, but for the entire Eurozone. Both sides are in something of a high-stakes faceoff: If Greece's leaders can't secure new lending terms they could be forced to choose between a bank collapse, leaving the Eurozone, or reneging on their own promises. None of those choices are attractive. But the options aren't good for the Europeans either. A Greek exit from the euro (they're calling it a "Grexit") would cast a shadow of doubt over the euro's viability. Moody's and other observers have concluded that a "Grexit" would also lead to a recession in Europe. If the Greeks win major concessions, on the other hand, that will embolden other nations to seek similar deals -- which could, in turn, roll back the austerity regime now in place across Europe. Many of us would see that as a good thing, but the leaders of the Eurozone presumably would not. 10. What other countries have anti-austerity movements? Spain has a new and growing political coalition called Podemos ("We Can") that resembles Greece's Syriza in both structure and platform. Like Syriza, Podemos formed after a public anti-austerity movement held major demonstrations. Polls have shown a major shift in support toward Podemos in recent months, and a Podemos rally in support of Syriza drew 100,000 supporters in Madrid last week. Portugal, which was rocked by anti-austerity demonstrations in 2012 and 2013, is considered fertile ground for an anti-austerity movement if Syriza succeeds. Demonstrators turned out in Ireland last week to protest one of that nation's austerity measures, a new fee for water usage. The fee had symbolic value, since water had been proclaimed a human right by the first president of the Irish Republic. A new political coalition, the Anti-Austerity Alliance, has been formed and has won several by-elections but has yet to face a major electoral test. Anti-austerity riots erupted across Italy in November of last year. An idiosyncratic political party there, the Five Star Movement, has grown rapidly. It captured a significant number of votes in 2013 legislative elections and in 2014 voting for the European Parliament. The Five Star Movement describes itself as "Euroskeptic" and is presumably sympathetic to coalitions like Syriza and Podemos. 11. Is there a "moral hazard" in all of this? Sure. When somebody takes a risk and is not forced to take full responsibility for it, financial and insurance experts say that creates a "moral hazard" by rewarding (and therefore encouraging) irresponsible behavior. Critics of the anti-austerity movement say they're concerned about the moral hazard that might be created if the Greek (or Spanish, or Irish, or Portuguese) people aren't forced to pay their debts. But these populations have suffered and sacrificed quite a bit already. At what point is their side of the ledger wiped clean, especially when others incurred these debts on their behalf -- and when those debts have primarily been used to rescue bankers? The Irish people didn't create the housing bubble that decimated their economy. Nor did they know that, after it burst, the European Central Bank secretly pressured the Irish government to accept a bailout and assume obligation for the funds being given to Irish banks. The Greek oligarchy is filled with notorious tax evaders, but the Syriza government has promised to crack down on them. And while some of Greece's creditors have already taken a "haircut," it is the financial community -- not ordinary citizens -- that is expected to understand risk and underwrite loans accordingly. As Martin Wolf put it, "creditors have a moral responsibility to lend wisely." The lesson? Nobody likes moral hazard -- but there is disagreement about where it lies. 12. What will happen in Europe? A lot of speculators would love to know the answer to that question. The relevant markets have been rocked back and forth (and back again) since Greece's elections. The Greek government has taken a more conciliatory stance in the last few days by reframing its "haircut" demands in softer terms, agreeing to operate at a surplus going forward, and even offered to backtrack on some of its campaign promises. But the Greeks are still committed to changing their government's debt obligations to more closely reflect the democratically expressed will of its people. Perhaps as a result, Germany's leaders have failed to respond to Greece's overtures with their characteristic warmth. They've even tried to make Greece's life more difficult. One suspects it's all part of the posturing. The Eurozone must still deal with the underlying tension between a single currency and multiple democracies. And it must somehow work to keep Greece in the euro. Some sort of compromise still seems all but inevitable. Otherwise, as Paul Krugman puts it, the German position is "basically crazy" and "all assertions that Germany understands reality are proved wrong." That outcome, however unlikely, remains a possibility. 13. What's next for the United States? Here at home, the banking industry is working overtime to roll back the modest regulatory changes contained in the Dodd-Frank financial reform bill. Austerity forces in this country, while less powerful than their European counterparts, have already enacted spending cuts that created significant "fiscal drag." Wall Street has a number of willing allies on the Democratic side, and the Republican Party seeks its approval with tail-wagging eagerness. It will be hard to change this state of affairs until we reform our system of campaign financing. That means we remain at risk for additional austerity measures. But there is also a growing populist movement, both inside and outside the political system. Leaders like Sens. Elizabeth Warren, Bernie Sanders and Sherrod Brown are likely to keep resisting Wall Street's unwholesome influence on our democracy. Even some of the Democratic Party's key economic "insiders" have moved a little further to the left on matters of government spending and wealth inequality. With every day that passes, however, it's less likely that any major banker will be prosecuted for the major acts of fraud committed in their institutions. There's a lot of moral hazard going around these days. 13a. We're lucky we don't have anybody like the Germans pushing austerity in this country. Oh, but we do. They're called Republicans.